Bring in the New Year with your family on the Deccan Odyssey, an ode to the princely tradition of luxury trail travel. Discover the Jewels of the Deccan over 8 wonderful days, and experience royalty on rails as you explore the many wonders of Mumbai, Bijapur, Hampi, Hyderabad, and Aurangabad. Day 01 Board the Deccan Odyssey train at Mumbai Chhatrapati Shivaji Terminus and get ready for wonderful journey to Bijapur. 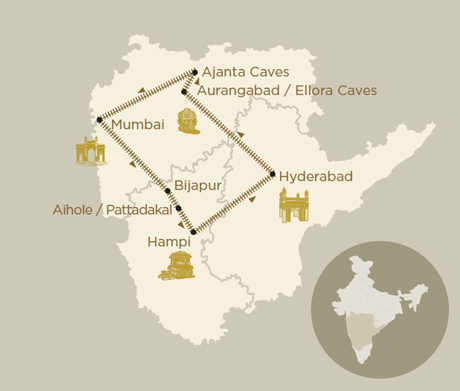 Day 02 Today, you will reach the historic capital of the Sultans of the Deccan, Bijapur. Stunning citadels, along with beautiful buildings and tombs await you here. Day 03 This morning, explore the spectacular Chalukyan temples of Aihole and Pattadakal. Notice the contrast in the architecture of the temples, and the two locations built in successive time periods. Day 04 Arrive at Hospet. Discover Hampi, also known as the City of Victory. This destination is home to many sacred and royal centres, palaces and impressive temples. Day 05 Today, you will disembark in the royal city of the Nizams - Hyderabad. First stop at the Golconda Fort. It was constructed in the 13th century capital, and then went on to become the capital of the Qutb Shahi dynasty. This is the spot where huge diamonds like Hoe and the Kohinoor were mined. Later in the evening, explore the famed Charminar, and walk through the colourful streets. This evening in the royal city will certainly be special! Day 06 Proceed to yet another prominent World Heritage site - the Ellora Caves. These caves are a beautiful representation of the spirit of tolerance that was characteristic of ancient India through sanctuaries devoted to Buddhism, Hinduism and Jainism. Day 07 Today you will arrive at Jalgaon railway station, and proceed to Ajanta Caves. These glorious caves feature stunning ancient sculptures and murals that depict the life of Buddha. After lunch on the Deccan Odyssey, visit the Mahatma Gandhi memorial. Day 08 Arrive at Mumbai, where your journey comes to an end. Accommodation in double / twin bedded cabin with en suite bathrooms. Soft beverages including juices, mineral water and aerated drinks during the journey. Guided off board excursions on seat in coach basis for Deluxe cabins and private car for Presidential Suites as illustrated in the itinerary - inclusive of entrance fees, park fees, transport and services of an English speaking local guide. Video and professional Still camera fees. Tour extensions unless specifically mentioned as a part of the journey. All activities mentioned as 'options' in the itinerary. Taxes including 5.00% Good and Service Tax, Insurance , gratuities. 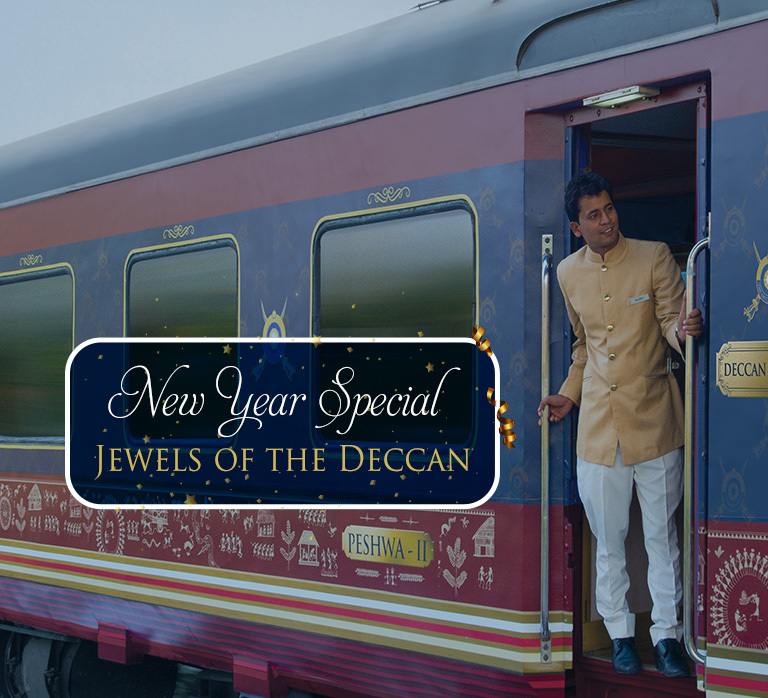 Offer is applicable for bookings made for 29th December 2018 – Jewels of the Deccan journey. 01 Cabin free for 02 Children up to the age of 12 years on booking 01 cabin for 02 adults. Valid for FIT bookings with passenger passport copies only. Valid for Deluxe Cabins & Presidential Suites. GST of 5% will be charged extra on total invoice cost. As a policy of Deccan Odyssey, we reserve the right to change or cancel the operations of any departure on Deccan Odyssey which shall be informed 45 days in advance to the departure date. Booking to be confirmed with advances before 31st October 2018. © Luxe Train Journeys. All Rights Reserved.